Backyard Wild Bird feeders can be Squirrel proof bird feeders with the right Bird feeder poles, bird feeder squirrel baffles and caged bird feeders. 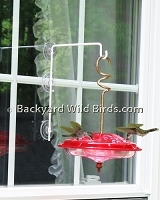 Popular categories are tube bird feeders, squirrel proof bird feeders, and window bird feeders. Recycled Bird Feeders and Special Bird Feeders are feeders for more specific types. The best bird feeders have quality, good seed delivery and low maintenance. Below are representative examples of a each subcategory of bird feeders. 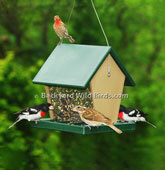 The first is a great classic tube bird feeder is the Bird feeders bird feeder. Examples of other Products types that are a tree hanging baffle protected squirrel proof bird feeders are the Hanging Baffle Tube Bird feeder and the Squirrel Baffle Bird Feeder. Below are choice bird feeders from each sub-category that excel in what birders want in bird feeders. Their detailed features that set them apart are emphasized to make selection easier. 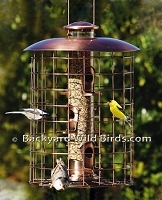 Click on each Class to see all the different Bird Feeder styles in their sub-category. 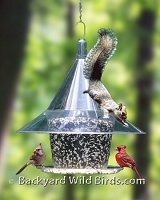 See other bird feeder design tips and how to have Squirrel proof bird feeders here. Don't miss out! CLICK ON EACH PICTURE TO SEE ALL THE BIRD FEEDERS .